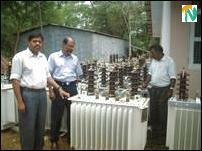 Mr.Selvarjah Prabakaran the Kilinochchi Regional Electrical Engineer, Mr.Kadirathe Piyasena, Kilinochchi Regional Store Keeper of CEB, Mr.A.D.A.Nimal the Electrical Superintendent of CEB for Kilinochchi Region are seen inspecting the arrivals of new transformers. 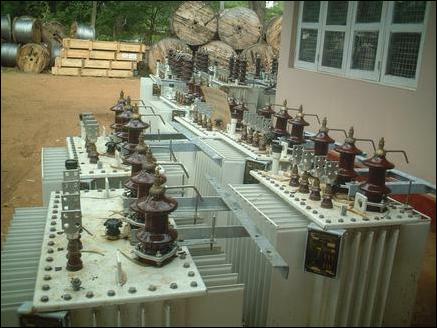 Under this scheme 11 villages in Kilinochchi district and 6 villages in Mullaitivu will receive electricity. Rs81.5 million for Mullaitivu and Rs.92.7million for Kilinochchi have been allocated to implement this scheme according to Selvarajah. Mullitivu town (2), Mulliyavallai, Thannnirootu, Puthukudiyiruppu and Manthuvil towns in Mullaitivu district are the towns to benefit under this scheme. Kilinochchi town (2), Paranthan, Karadipoku, Vaddakachchi, Ganesapuram, CTB depot, Kanagapuram, 155th miule podt, Kanagambikaikulam, Murikandi in Kilinochchi district will receive electricity under this plan. The effort to provide electricity to the 9.5km stretch of A9 extending from Omanthai to Puliyankulam under financial support of Rs.24million from European Commission has been temporarily suspended with only 30% of the work completed. The delays in demining the no-man's land between the checkpoints of Sri Lanka Army (SLA) and Liberation Tigers, and high rainfall were the main causes of work slip, officials said. The project was originally scheduled for completion in September 2003.